Section 8 of the The Northern Forest Canoe Trail begins at Umbagog Lake. Photo courtesy of Jeremy Sacco. If you love canoeing and kayaking, make plans to explore the Northern Forest Canoe Trail. This 740-mile route follows ancient Native American trails through scenic landscapes and waterways, from flat to white water, streams to lake, as it winds from Fort Kent, Maine south to Old Forge, New York. The trail passes by more than 50 notable destinations, diverse communities and a range of landscapes, including scenic sites in New Hampshire, Vermont and Quebec, Canada. The Maine section of the trail encompasses 348 miles and stretches from Rangeley to Fort Kent. Visitors can spend a half-day or weeks exploring this scenic route, although if you’re feeling especially adventurous, you can try to beat the record for fastest paddle-through set by Skip Ciccarelli in 2011: This Massachusetts high-school teacher paddled the entire route in only 25 days! Most visitors, though, like to take their time and enjoy the stunning natural beauty and historical sites. Along the way, paddlers can experience the importance that Maine’s waterways played to the state’s people and development through history, from indigenous populations to European settlers, mill towns to the timber industry. You can explore the route on your own or travel with one of Maine’s many registered guides. The NFCT is broken into 13 sections; six are in Maine. Located in the Rangeley Lakes region on southwestern Maine’s border with New Hampshire, paddlers in this section pass through a series of large, interconnected lakes — including Rangeley, Mooselookmeguntic, Lower and Upper Richardson, and Umbagog – as well as miles of undeveloped wilderness and wildlife habitat. Section 8 encompasses the Umbagog National Wildlife Refuge, a 4,100-acre preserve that’s home to ospreys, loons, bald eagles, boreal chickadees and peregrine falcons. The region is also known for its excellent fishing. This section is generally traversed from east to west, starting at Errol. The nearest towns — Dixville Notch, Phillips, Oquossoc and Rangeley — are all more than a mile from the route, but many offer lodging, dining and supplies. Shuttle services are available in the town of Oquossoc. Section 8 generally takes from two to four days. 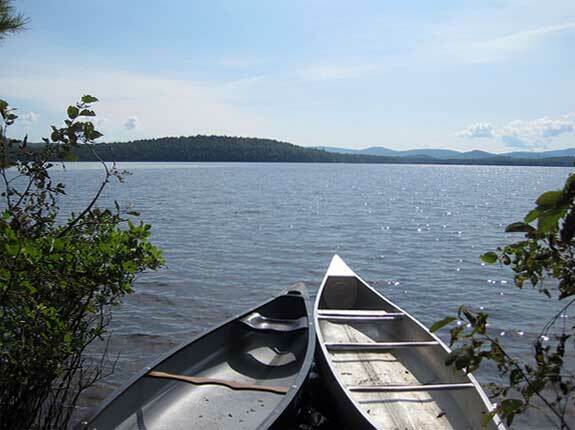 Section 9 runs from Rangeley Lake to Spencer Stream, passing through the shallow, flat waters of 30-mile-long Flagstaff Lake and through the 36,000-acre Bigelow Preserve, home to the seven peaks of the Bigelow Range and part of the Appalachian Trail hiking network. Other attractions in this section include the Dead River’s stunning, 30-foot Grand Falls, and a whitewater run on the river’s south branch. Communities near this route that offer food and lodging include Stratton and Eustis. There are several hotels and lodges along the way, and Flagstaff Lake is part of the Maine Huts and Trails network. Expect to spend at from two to four days exploring this section. See remains and relics from the historic town of Flagstaff at the Dead River Historical Society in Stratton; the town was established by Benedict Arnold in 1775, but lost forever in 1949 when Flagstaff Lake when the region was flooded to create Flagstaff Lake. Section 10 begins in the Spencer Stream watershed, passes through Attean Pond and the Moose River and ends in Moosehead Lake, Maine’s largest inland body of water with more than 400 miles of shoreline and 80 islands to explore. This route contains the historic loop route known as the Moose River Bow Trip. It passes by the logging communities of Jackman and Rockwood, both popular year-round destinations for outdoor recreation. Both towns have local shuttle services available, as well as lodging, camping and dining. Other attractions along the way include Historic Pittston Farm, set on the north and south branches of the Penobscot Rivers and Sebomook Lake. In Jackman, the Arnold Farm Sugarhouse offers tours of its organic maple sugar operation. Expect this section to take three to four days. The most remote section of the NFCT stretches from Umbazookus Stream to Umsaskis Lake. It passes through Caucomogomoc, Allagash, Chamberlain, Eagle and Churchill Lakes, all known for excellent fishing. This section connects to the 92-mile-long Allagash Wilderness Waterway, filled with swift rivers, streams, ponds, lakes and thickly wooded wildlife habitat. Keep your eyes open for the resident moose, deer, eagles and even the occasional black bear along the way. Shuttle services, camping, lodging and supplies are available in the towns of Allagash, Chesuncook Village, St. Francis and Greenville. This historic route was long used by the native Abenaki, and fans of Henry David Thoreau’s works may recognize the author’s words in many sites along the Allagash River. Expect this trip to take from six to seven days to complete and watch for the white water rapids at Chase River. At the easternmost end of the NFCT, section 13 continues along the Allagash River from Umsaskis Lake to the St. John River on the Canadian border. This remote and historic section was long used by Native Americans and European settlers, as well as the logging industry. Along the way, shuttle services, lodging, camping and supplies are available in Allagash, St. Francis and Fort Kent. Expect to make one short portage on Harvey Pond, where old timbers protrude from the water. This section of the NFCT can take from five to six days to traverse.